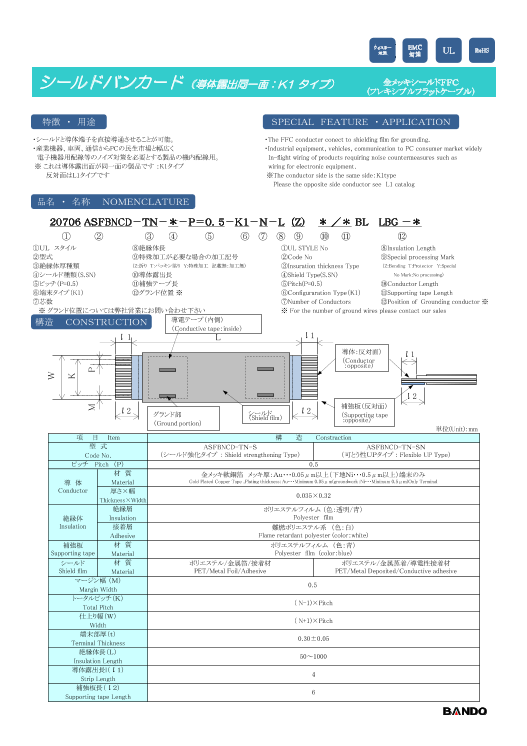 グランド線との接続方法 Connection to grounding conductor 導電テープの導電性接着剤で導通 (Connected to grounding conductor by conductive adhesive of conductive シールド（Shield グランド線 （Grounding conductor） ULスタイル及び性能例 UL STYLE No. and example of UL スタイル 20706 電圧 （Ｖ） 60 定格 Volt. Rating 温度　（℃） 105 Temp. 絶縁抵抗 1000MΩ-m以上 D.C. 500V Insulation Resistance Min 1000MΩ-m 隣接導体間 A.C. 500V×1min　異常なし 耐電圧 Ｂｅｔｗｅｅｎ Ａｄｊａｃｅｎｔ Ｃｕｎｄｕｃｔｏｒｓ No Breakdown Dielectric Strength 導体/シールド間 A.C. 250V×1min　異常なし Ｃｕｎｄｕｃｔｏｒｓ/Ｓｈｉｅｌｄ No Breakdown 難燃性 VW-1　合格 UL 758 Flammability VW-1 Pass 端末タイプ Configuration Type 端末タイプ　Ｃonfiguration Type Ｋ１　ＴＹＰＥ ・同一面に導体露出 ・Supporting tapes of both ends are on the same side. ※本カタログの仕様・構成等は性能改善の為、お断り無く変更する場合がございます。 ※This specification is subject to change without a prior announcement. グランド線との接続方法 Connection to grounding conductor 導電テープの導電性接着剤で導通 (Connected to grounding conductor by conductive adhesive of conductive シールド（Shield グランド線 （Grounding conductor） ULスタイル及び性能例 UL STYLE No. and example of UL スタイル 20706 電圧 （Ｖ） 60 定格 Volt. Rating 温度　（℃） 105 Temp. 絶縁抵抗 1000MΩ-m以上 D.C. 500V Insulation Resistance Min 1000MΩ-m 隣接導体間 A.C. 500V×1min　異常なし 耐電圧 Ｂｅｔｗｅｅｎ Ａｄｊａｃｅｎｔ Ｃｕｎｄｕｃｔｏｒｓ No Breakdown Dielectric Strength 導体/シールド間 A.C. 250V×1min　異常なし Ｃｕｎｄｕｃｔｏｒｓ/Ｓｈｉｅｌｄ No Breakdown 難燃性 VW-1　合格 UL 758 Flammability VW-1 Pass 端末タイプ Configuration Type 端末タイプ　Ｃonfiguration Type Ｌ１　ＴＹＰＥ ・裏表互い違いに補強板 ・Supporting tapes of both ends are on the opposite side. ※本カタログの仕様・構成等は性能改善の為、お断り無く変更する場合がございます。 ※This specification is subject to change without a prior announcement.